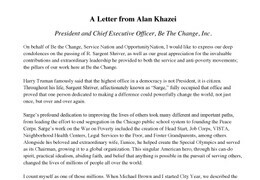 On behalf of Be the Change, Service Nation and Opportunity Nation, I would like to express our deep condolences on the passing of R. Sargent Shriver, as well as our great appreciation for the invaluable contributions and extraordinary leadership he provided to both the service and anti-poverty movements; the pillars of our work here at Be the Change. Harry Truman famously said that the highest office in a democracy is not President, it is citizen. 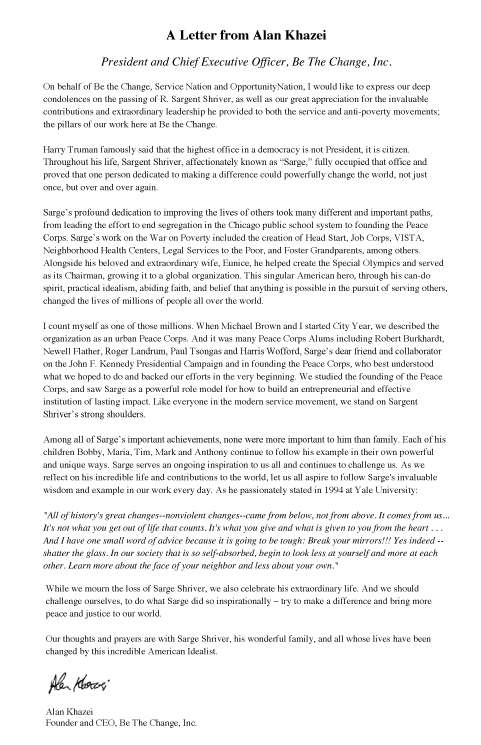 Throughout his life, Sargent Shriver, affectionately known as "Sarge," fully occupied that office and proved that one person dedicated to making a difference could powerfully change the world, not just once, but over and over again. Sarge's profound dedication to improving the lives of others took many different and important paths, from leading the effort to end segregation in the Chicago public school system to founding the Peace Corps. Sarge's work on the War on Poverty included the creation of Head Start, Job Corps, VISTA, Neighborhood Health Centers, Legal Services to the Poor, and Foster Grandparents, among others. Alongside his beloved and extraordinary wife, Eunice, he helped create the Special Olympics and served as its Chairman, growing it to a global organization. This singular American hero, through his can do spirit, practical idealism, abiding faith, and belief that anything is possible in the pursuit of serving others, changed the lives of millions of people all over the world. I count myself as one of those millions. When Michael Brown and I started City Year, we described the organization as an urban Peace Corps. And it was many Peace Corps Alums including Robert Burkhardt, Newell Flather, Roger Landrum, Paul Tsongas and Harris Wofford, Sarge's dear friend and collaborator on the John F. Kennedy Presidential Campaign and in founding the Peace Corps, who best understood what we hoped to do and backed our efforts in the very beginning. We studied the founding of the Peace Corps, and saw Sarge as a powerful role model for how to build an entrepreneurial and effective institution of lasting impact. Like everyone in the modern service movement, we stand on Sargent Shriver's strong shoulders. "All of history's great changes -- nonviolent changes -- came from below, not from above. It comes from us... It's not what you get out of life that counts. It's what you give and what is given to you from the heart . . . And I have one small word of advice because it is going to be tough: Break your mirrors!!! Yes indeed -- shatter the glass. In our society that is so self-absorbed, begin to look less at yourself and more at each other. Learn more about the face of your neighbor and less about your own." While we mourn the loss of Sarge Shriver, we also celebrate his extraordinary life. And we should challenge ourselves, to do what Sarge did so inspirationally -- try to make a difference and bring more peace and justice to our world. Our thoughts and prayers are with Sarge Shriver, his wonderful family, and all whose lives have been changed by this incredible American Idealist.